After servicing home heating and cooling systems for over a century, we’re well aware that air conditioning doesn’t come as a standard creature comfort for most old homes. In fact, of all homes built before 1940, only 50% have a central duct system. For old home owners, this poses a serious problem during the hot summer months, with many wondering: What are the air conditioning options for older homes? 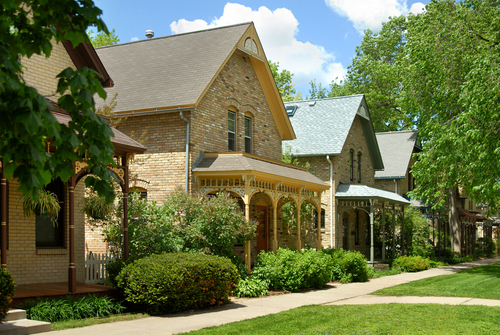 If you’re the owner of one of Minnesota’s many historical or older homes that doesn’t have air conditioning or ductwork, you need to consider all of your options. To help you find a solution that’s right for your home—and your budget—we’ve highlighted the three best air conditioning options for older homes. Can you install central air in an old house? Sure. It’s an expensive and timely undertaking, but central air conditioning controls the climate of the whole home and offers higher efficiency—a key component that may mean money back in your pocket. Or, you can upgrade to an air source heat pump system for both heating and cooling, which has a range of benefits when working in tandem with your furnace. In fact, one of the benefits of using a heat pump to assist your furnace is it can cut your winter electricity bill by up to 40%. But before you become sold on investing in central air or heat pumps, we also need to talk about power. Older homes often times only have a 60-amp service for the entire house. Well, central air conditioners usually require 20-50 amps of power. This puts the rest of your home’s appliances in a battle for electricity. It’s possible you may even need to upgrade your circuit breaker box, adding more a few more zeros to the end of your total cost. Bottom line: If your pre-1940’s home doesn’t have existing ductwork, installing central air in an older home is intensive and expensive. However, central air and heat pumps offer some of the greatest efficiency all year round, reducing your energy bills and maximizing the comfort of your home. On the opposite side of the spectrum from central air is installing window units. Window units are your most inexpensive option from an equipment standpoint and are the easiest to install. When cooling rooms from 100 to 500 square feet, window units are energy efficient and can keep rooms cool in extreme heat. In addition, there is a wide variety of units in the market, ensuring you can find the right A/C unit for any room in your house. All benefits aside, window units aren’t the ideal solution for old homes. Considering that older homes haven’t adopted today’s style of open concept living and have many walled-off rooms, it’s likely you’ll need a window unit for each room in your house. If you have more than five rooms that need some heat relief, it won’t be long until you have a battalion of window units to maintain, which is typically expensive when it comes to your electricity bill. Furthermore, window units need to be installed in an open window. For the ground level of your home, this can pose a security risk and provide easy entry into your family’s home. This also means you’ll want to uninstall all of your window units before winter for your home to stay warm. And speaking of windows, older homes typically have antique window styles that may not be compatible with a window unit. For example, shutter, slider, and casement windows don’t offer window units a secure place to be installed. Bottom line: While each unit is inexpensive, you’ll need multiple units that may or may not work well with your home’s windows, and will need to be winterized or uninstalled for winter. Not to mention the fact that if you have to run multiple units often, your energy bills could skyrocket. Ductless air conditioning is a great option if you’re not willing to carve ducts into your historical home or maintain several window units. Also known as a mini-split system, ductless air conditioners have many benefits, not least of which is having cooling for multiple areas in your home. Plus, the comfort level of each area is customizable with one ductless system offering individual, compact vents for up to eight rooms. Ductless systems are also very energy efficient because the condenser will automatically adjust to save electricity if you turn off several vents in your home. And depending on the system you choose, your ductless system can heat your home in the winter further reducing energy costs. The only downside to a ductless, mini-split air conditioning system is the price. While not as expensive as retrofitting your home with central A/C and ducts, it’s still an investment, especially for the higher-end multi-room systems. But to us, the energy efficiency and convenience of a ductless A/C for an old home is second to none. Bottom line: Ductless air conditioning won’t tear up the charm of your old home and one system can efficiently cool several rooms, but it requires a larger initial investment. Ready to Add Air Conditioning to Your Old Home? Take the guesswork out of installing the right A/C unit for your old home and contact us today for a consultation and a complimentary quote.